The Geopointe 1.4 release includes a feature called Add To Campaign. This feature will sense whether leads or contacts are on the map and, if the running user has the authority to manage campaign members, an Add To Campaign button will appear, allowing them to add those leads and contacts to an existing Salesforce campaign. 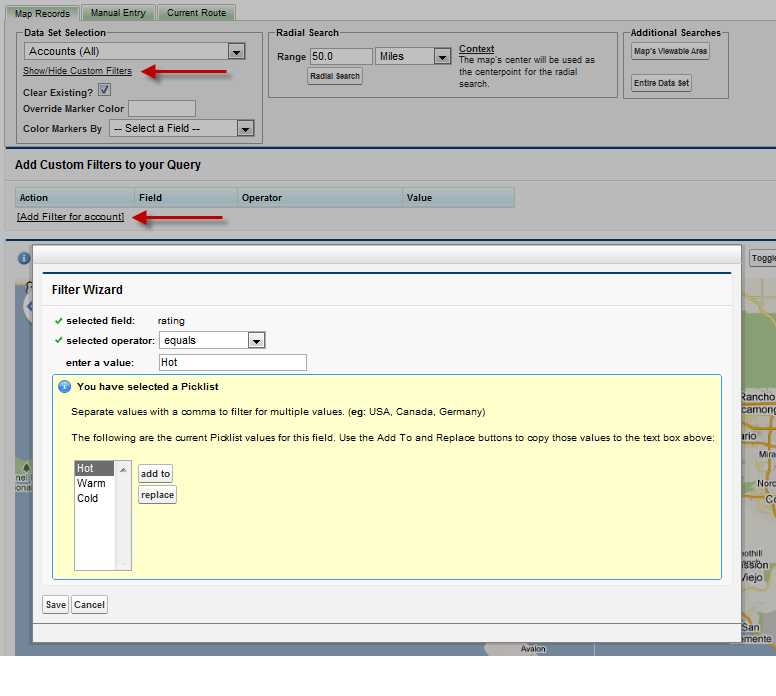 Watch the video below for a demonstration of this functionality. Geopointe 1.4 has been released on AppExchange. The Update History page has the full list of changes in this release. Below are highlights of the major changes, especially those that will impact end users’ experience with the application. You should make your users aware of these changes. Current users can find the upgrade instructions here. 1. The Records to Route list has moved. 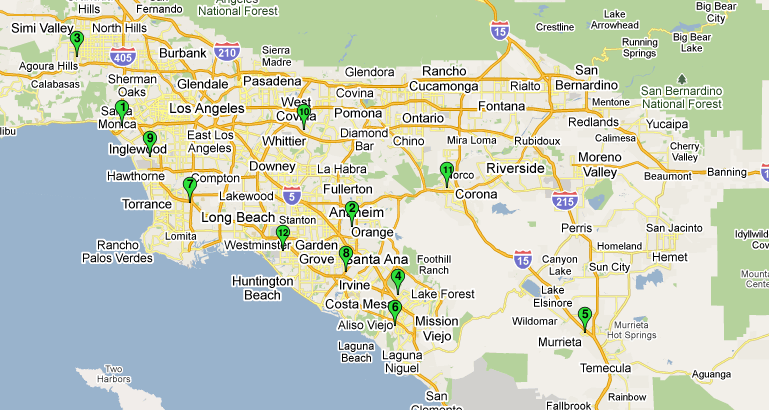 It is now located in a tab that will dynamically appear above the map called “Current Route”. 2. 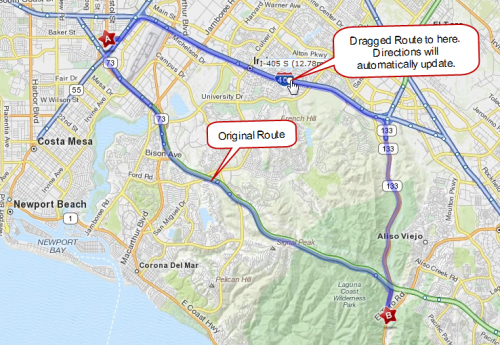 A link to send the route to the Google or MapQuest website (based upon your subscription) will allow you to send those points out to the mapping provider’s site to work on things there. 3. After clicking Get Route, the route is available for printing to PDF. 4. Save Routes! When this button is clicked, the system will prompt them for a name. If the user opens a saved routes, additional buttons will appear here (Save As and Delete). 5. Geocode quality is now displayed to help the user know whether they have mapped a location to a specific address or just to the middle of a city/state/zip. After generating a route, you can click the PDF icon to pull that route into a PDF for printing or emailing. The list of Saved Routes is available on the Manual Entry tab. Click the Run Route button to launch the route. 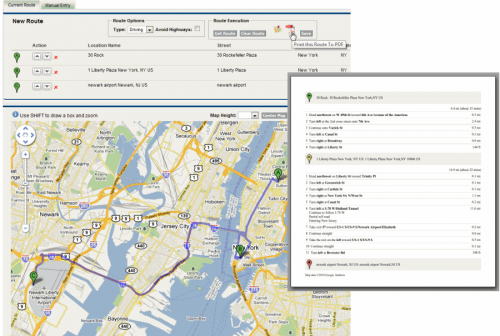 Once a route has been saved, it can be shared with other Geopointe users in the organization. Just copy the link from the browser after running a route. It will look something like https://geopointe.na1.visual.force.com/apex/map?routeId=a0830000008G6MqAAK. Running someone else’s route is just like running your own with a few minor changes to the UI. 1. Text will indicate that you are running a saved route of another user. 2. You have no access to the Save and Delete buttons. When a lead or contact map is run, the system will assess whether the current user has the rights to add Campaign Members. If so, an Add To Campaign button will appear at the top of the list of mapped records. When clicked, the user is launched out to the Add to Campaign screen in a separate browser window/tab. 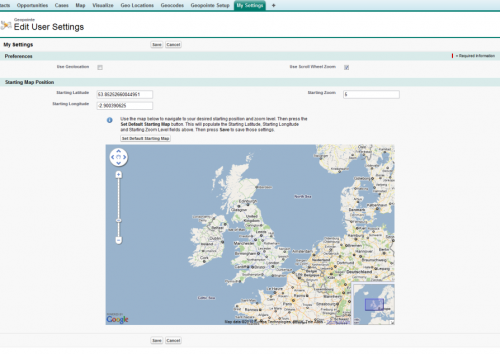 When records are returned with the map, you can sort the list by any column. The system is smart as to whether it’s a text or number field, so it sorts it properly. A new tab was added to allow users to edit their personal settings. This tab goes to the same destination as the My Settings link just above the main Map on the Map tab. There is more. The Update History page has the full list of changes in this release. Geopointe has a number of under-the-cover features (and more to come) that allow you to integrate with the application. 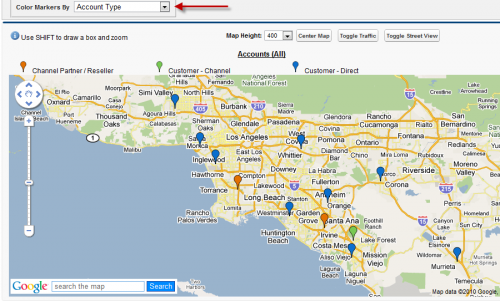 One such feature is the ability to use the map as a means of populating a Lookup field. Below is a video showing this feature in action. The above is the URL from the button included with the application. It is required to sent the user to the proper page in the proper context. wbRecordId is the ID of the record we will be writing back to. wbField is the field on that record we will be populating. wbLookupObject is the object type that we will be searching for and populating the lookup field for. wbButtonText is optional, but can be included if you want to customize the button’s text. It is recommended to use the URLENCODE function when specifying your text, especially if you are merging in data from the system. We are pleased to announce the release of our newest application, Geopointe. Geopointe integrates Force.com with Google Maps and MapQuest and is the premier Force.com geo/mapping solution providing numerous ways for end-users, administrators and developers to take advantage of geo data and maps. Contains an “API” with global Apex methods, Visualforce Components and the ability to extend the application using custom buttons. All existing Arrowpointe Maps customers get a free license transfer to Geopointe for the same user count and expiration date as their current license with a goal to get users off of Arrowpointe Maps and onto Geopointe.